Wilson Homes has 288 newly renovated apartments ranging from one to five bedrooms. The floor plans vary and some units include balconies. Our residential community has sidewalks, shady trees with airy gazebos. Our homes are cable ready and include such amenities for your family as central heat and air, washer and dryer connections, water/sewer, trash collection, covered mailbox collection sites, community room and on-site playgrounds. Residents are responsible for electricity and phone. Please note our units are total electric with full size stoves and refrigerators! We also feature on site management and maintenance staff! 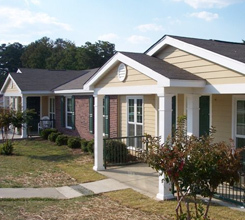 Our community is centrally located close to all hospitals and doctor offices. 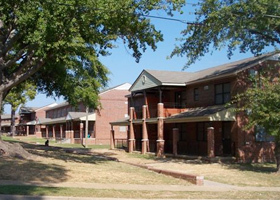 The 29th Street Gym/recreation center is located within walking distance of the complex. We have a Resident Resource Center on the property which allows access to computers and they have a tutoring program for school aged children. We have a Resident Council and a Kid's Cafe located onsite: they provide hot meals and healthy snacks for children after school and during summer months. We have many programs for our families to help them improve their lives and move forward! The ROSS program helps residents with establishing life changing goals. Our FSS (Family Self-Sufficiency) Program gives our residents life tools they can use for their future! We have many educational and fun activities for our community such as dance classes, bible study, block parties and we are a routine stop for the book mobile! Kool Smiles loves our kids and we also have health fairs and job fairs. Fox Elementary School is within walking distance and adjacent to our property, Allen Elementary, Double Churches (elementary and middle) Johnson Elementary, River Road Elementary, Arnold Middle School, Daniel Alternative School, Jordan High School and Muscogee County Evening School, Columbus Technical College are choices for our residents.